VoilaVe's Hyaluronic Acid Serum chosen 'Amazon's Choice.' This prestigious program by Amazon recognizes highly rated and well priced products offer exceptional value to consumers. 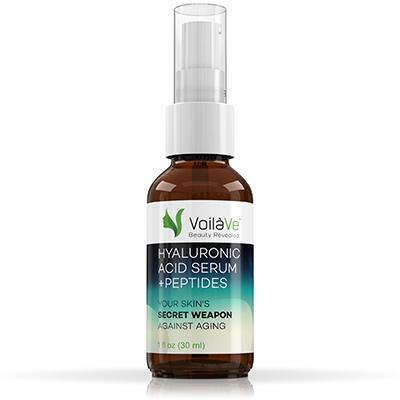 VoilaVe, #BeautyRevealed, is proud to have VoilaVe’s Hyaluronic Acid Serum with Peptides chosen ‘Amazon’s Choice’. This prestigious program by Amazon recognizes highly rated and well priced products that offer exceptional value to consumers. This is the second VoilaVe product recognized by Amazon.com with its ‘Amazon’s Choice’ designation. VoilaVe’s 3in1 Under Eye Treatment Cream For Dark Circles And Puffiness previously attained this highly sought distinction. Hyaluronic acid assists the skin in hydration, skin repair, and protection against harsh UV radiation and free radicals. The main job that hyaluronic acid does in skin care is to hydrate the skin to keep it moist as it has excellent water retaining abilities which in turn reduce wrinkles since wrinkles are caused primarily by dehydrated skin. There are two kinds of hyaluronic acid. There is low molecular weight hyaluronic acid (also known as LMW-HA) and high molecular weight hyaluronic acid (HMW-HA). These have two very different results when applied together in skin care products. New research shows that low weight hyaluronic acid alone is not enough for proper skincare. However, when combined with the high molecular weight hyaluronic acid the benefits become very clear. While the regenerative qualities of hyaluronic acid are found within the high molecular weight acid, the responses produced by the low molecular weight acids improve the ability of the skin to defend itself by activating chemicals in the body to work better for the epithelium. “The fact that VoilaVe’s Hyaluronic Acid Serum with Peptides combines the two types of hyaluronic acid makes it the leading edge hyaluronic acid on the product today and a major reason why Amazon selected it for Amazon’s Choice”, said VoilaVe Co-Owner and well known fitness model, Skylar Lear. His co-owner, sister and renowned model, Tracy Lear added, “VoilaVe integrates the latest scientific research into product products that are extremely effective. It is very gratifying that the leading Ecommerce Platform in the world has recognized VoilaVe’s superior products”. VoilaVe, #Beauty Revealed, is the World’s Leading Skincare Products Company sourcing the best in organic ingredients from around the globe and manufacturing leading edge natural beauty products in the United States. Leading VoilaVe skincare products include Organic Moroccan Argan Oil, Triple Action Vitamin C Serum, 3in1 Under Eye Treatment, and Face Tightening with Retinol.